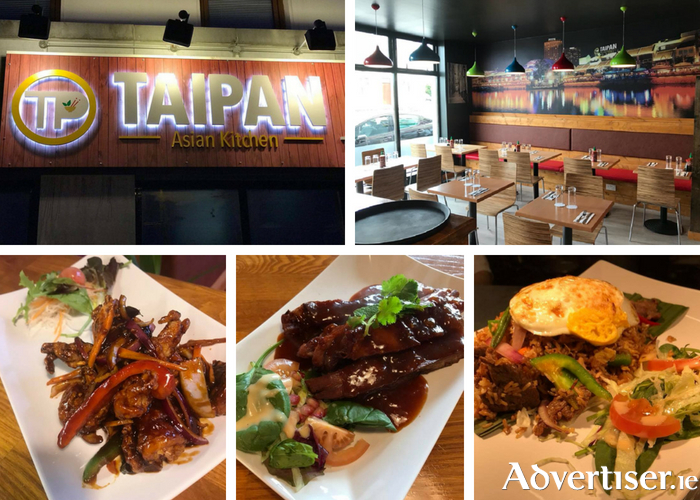 Advertiser.ie - Taipan Asian Kitchen launches new menu! With the delicious flavours, tastes or aromas of Asia, Taipan Asian Kitchen is another wonderful reason to visit the bustling village of Moycullen. Serving multi-cuisine dishes from the Asian region, the superb new restaurant with a spacious design has launched a new palate-delighting new menu. Offering soups, salads, main courses, noodle dishes, rice dishes, and chef's special dishes, customers are guaranteed to find a mouthwatering meal to suit their tastes from this new and improved selection. However for those who have their particular choice of Asian dish, there is no need to fear, as the menu still retains old customer favourites such as Singapore noodles, Thai green and red curry, crispy shredded chicken with a choice of sauce, Malaysian Penang curry, Kung Po, peanut satay sauce, Szechuan sauce, and Malaysian spicy nasi goreng. Dishes have zero per cent MSG, and customers are able to attain vegan and gluten-free options by request. With so many options the biggest problem a customer will face is what dinner to choose from. But the warm, welcoming staff will be on hand to suggest their favourite dish should that situation arise. Located in An Furaran in Moycullen with plenty of car parking, the restaurant is the perfect setting for a gathering of friends, an intimate date, or stomach satisfying and filling meal after a day exploring Connemara. However, if a customer is looking to eat on the go or wishes to enjoy the delicious food from the comfort of their own home, Taipan Asian Kitchen offers a takeaway service as well. For more information visit their Facebook page or call 091 868996.